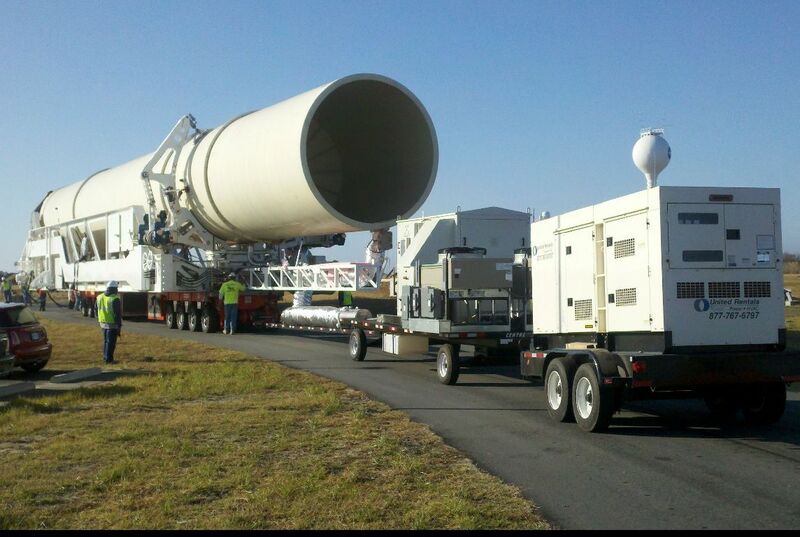 Air Innovations partners with NASA and Orbital Sciences for inaugural Antares rocket flight. Air Innovations supplied environmental control systems for the rocket's payload. On this and future Antares flights, Air Innovations' ECUs are responsible for conditioning the key stages of the rocket's payload during pre-launch. Air Innovations’ client and NASA partner Orbital Sciences Corp. successfully launched Orbital’s Antares rocket from the new Mid-Atlantic Regional Spaceport (MARS) at the agency’s Wallops Flight Facility in Virginia. The test flight was the first launch from the pad at Wallops and the first flight of Antares launch system, whose rockets will be resupplying the International Space Station later this year. Air Innovations provided three water-cooled environmental control systems (ECUs), and a portable, air-cooled ECU that was built on a 25-foot trailer. These systems were among the largest ever designed and manufactured by Air Innovations. Air Innovations’ President and CEO Michael Wetzel explained that, “On this and future Antares flights, Air Innovations’ ECUs are responsible for conditioning the key stages of the rocket, including its payload, during pre-launch.” First, the rocket is outfitted with its payload about a mile from the launch site. Then it is towed in a horizontal position to the site, a lengthy process during which the contents of the payload section are maintained at temperature, humidity, filtration and pressurization parameters unique to that particular flight’s payload. The portable ECU accompanies the rocket on its crawl to the pad, steadily supplying the payload’s specific needs. Once at the pad, the rocket is raised into a vertical position. At that point, AI’s fixed systems, located deep in a bunker under the pad and managed from remote location, regulate the payload and the core stages’ environmental conditions until minutes before launch. A fixed, explosion-proof, Class I, Division II system that operates in corrosive salt-air conditions while providing low humidity to a payload during its installation near the top of a 235-foot rocket. This project is at a U.S. Air Force base on the West Coast, where satellites are flown into polar orbit using expendable boosters. A portable system that maintains cleanroom-quality air for spot applications and portable isolators in a satellite assembly facility at another U.S. Air Force base, where a broad range of environmental inlet conditions have to be met. The system provides 3.5 tons of cooling with an air-cooled condenser, 3.5 kilowatts of heating, 1200 CFM airflow, and high efficiency particulate air (HEPA) filtration. Air Innovations designs and builds environmental process control systems for applications that can’t be addressed with standard HVAC equipment. The company customizes packaged solutions for: temperature (with control tolerances as precise as plus or minus 0.01◦C); humidity (with control tolerances to plus or minus 0.5%); filtration (HEPA, ultra low particulate air [ULPA], and molecular); pressure; and, direct expansion, chilled water or thermoelectric capabilities. AI works closely with its clients to tailor products that can either be integrated into their original equipment or be freestanding. Air Innovations serves a broad range of industries, including aerospace, defense, semiconductor, R&D, pharmaceutical. Some recent AI projects include designing and building air conditioning for complex structures such as the cabins for very large Ferris wheels, process control systems for pharmaceutical blister packaging machines, and a cooling system for a silicon pixel sub-detector located inside a linear accelerator at a federal laboratory. The company also manufactures its own brands of environmental control products that are used by: fine wine collectors (Wine Guardian®); supermarket florists (Floratech®); hospitals (IsolationAir®); and, homeowners seeking purified room air (HEPAiRx®). All AI products are designed, tested and manufactured at its 40,000 square-foot headquarters in Syracuse, NY. The company has been the recipient of several awards, including Engineer of the Year (HPAC Engineering magazine 2011), and is one of the fastest growing, privately held manufacturers in America (Inc. magazine 2010, 2011). For more information, visit http://www.airinnovations.com, email info(at)airinnovations(dot)com, or call toll free 800-825-3268 (direct, 315-452-7400).